Crikey, now that's an adventure bike. In the vein of all-terrain versatility, Tom Ritchey designed an adventure bike that is equally at home in the dirt as on the pavement: the Outback. The perfect tool for any ride, anywhere. The Outback Featuring a lower bottom bracket for confident stability, the Outback is still high enough to easily clear any road/trail furniture. 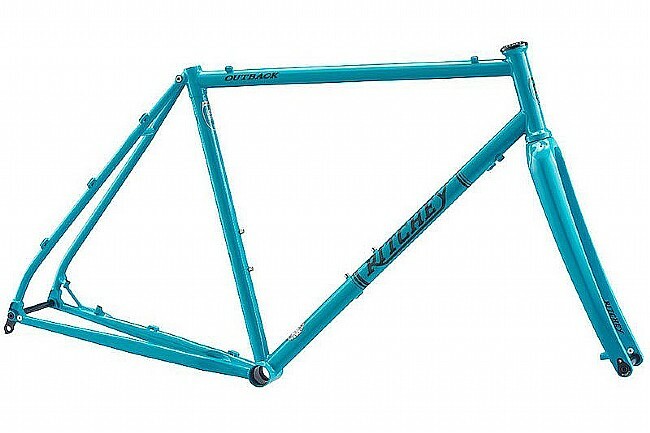 This versatile bike also provides generous tire clearance and Ritchey Logic heat-treated, double-butted directional tubing. Taking the Outback's off-road prowess to a new level, the frameset includes the new Ritchey Carbon Fiber Gravel thru-axle fork providing a confident and precise front end. Giving you an extra layer of comfort and performance, the fork can accommodate tires up to 40mm wide. The Outback’s impressive handling is more than capable on- or off-road — in any situation. If you're looking for a bike that's able to effortlessly switch between fire roads, trails, tarmac, long distance mixed-terrain adventures, and everything in-between, look no further than the Outback. Ritchey Carbon Fiber Gravel thru-axle fork. 12mm Thru-Axle front and rear. Fits up to 40c tires (depending on rim and tire manufacturers). Bottom Bracket: 68mm English Thread. Includes: Outback Frame, Carbon Fiber Gravel Thru-Axle Fork, headset.